Thermostable Flap Endonuclease 1, FEN1, creates a 5´-phosphate terminus by cleaving the 5´ DNA flaps from branched double stranded DNA substrates. The resulting DNA can then be ligated to create double stranded DNA. Thermostable Flap Endonuclease 1, FEN1, catalyzes the cleavage of 5´ DNA flaps from branched double stranded DNA substrates, creating a 5´ phosphate terminus. 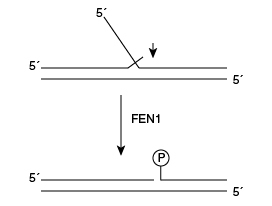 FEN1 products can be ligated by DNA ligase to create double stranded DNA. In vivo, FEN1 is an essential component of the Okazaki fragment maturation pathway, and also plays a role in base excision repair. Reaction Schematic Thermostable FEN1 recognizes and cleaves 5´ DNA flaps generating a ligatable 5´ phosphate terminus. An E. coli strain, which carries the cloned Thermococcus 9°N™ FEN1 gene. One unit is defined as the amount of enzyme required to cleave 10 pmol of 5´ flap containing oligonucleotide substrate in a total reaction volume of 10 µl for 10 min at 65°C. 1X ThermoPol Reaction Buffer containing 0.2 pmol of fluorescently labeled oligonucleotide in a total reaction volume of 10 µl. Balakrishnon, L. et al. (2013). Annu. Rev. Biochem. 82, 119-138. Greenough, L. et al. (2015). J. Biol. Chem. 20, 12514-12522. What is the activity of Thermostable FEN1 in various NEB Buffers? What is the activity of Thermostable FEN1 at various temperatures? What is the preferred substrate for Thermostable FEN1? What is the largest 5´ DNA flap Thermostable FEN1 will cleave? What is the smallest 5´ DNA flap Thermostable FEN1 will cleave? What are the various substrates that Thermostable FEN1 activity has been tested on, and what is the % Activity on each substrates?